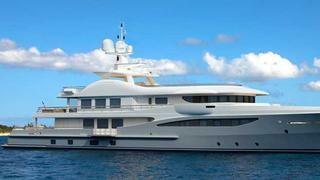 The 55m Amels 180 is an extended version of the Amels 177, with a beam of 9.4 metres and a gross tonnage of 650 tonnes. For the first yacht being built in this range customisation is being taken to a new level, and the extent to which Amels has been able to accommodate the ideas and innovations of the owner are testament to its flexibility and the resilience of the finely honed Limited Editions platform. On this yacht the main deck saloon has been extended by an additional third of its original area, and the interior space has been augmented by two folding balconies where guests can enjoy the open air. The owners will also have an outdoor extension from the master suite with their own fold-out balcony. A ‘wide body’ upper saloon has been created for a lighter, more generous space, and an extra 32 square metres has gone into the sun deck to accommodate a touch-and-go helipad, which becomes part of the guest area when not in use. Among the other innovations to be incorporated are sophisticated foldable swimming stairs that will be built into the swimming platform. The contract was signed in February 2011, with OCEAN Independence appointed to manage the project.